Where are the books now? My blank books and bookmarks are now available for sale at two fine establishments, Shelburne Arts Co-op in Shelburne Falls, MA, and Sawmill River Arts by the Montague Bookmill in Montague. In other news, I have been making plans for flax growing experiments this spring. Usually I don’t plant flax until mid-April or even early May, but spring has come very early this year. I have grand aspirations this year, and will be growing several varieties: a non-specified fiber flax variety from Richters, Evelin from Richters, Marilyn from the Hermitage, and a tiny quantity of Regina from Sand Mountain Herbs. Stay tuned for more updates about flax. Well, the Cottage Street Studios open house was very interesting. 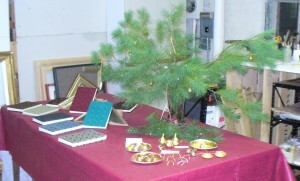 Here’s a photo of my books and some of Amanda’s gilded acorns, wishbones, and gourds around a festive winter-time tree. She also makes stunning gilded panels, frames, and other treasures. I met lots of great people and had inspiring conversations. My books have now moved to Food For Thought Books in Amherst where thy are available for sale. Here they are on display at the bookstore: Making these books is a multi-step process. I haven’t photographed every step, but I thought I should give an overview. Understanding the process helps people to understand the labor and expense involved in creating a handmade object. 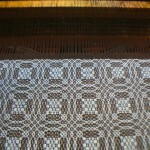 First I wove the cloth, using a variation of the traditional overshot pattern called Young Lovers’ Knot. This involved calculations about the sizes of the books and shrinkage of the cloth, as well as all the steps involved in dressing a loom. I put on a warp long enough to make 12 books. Even though I really loved the pattern, and enjoyed playing around with different color combinations, I was happy to get to the end of the warp when I finally finished it; it took a long time to weave. The pattern requires two shuttles, one with a thin thread (20/2, same size as the warp) and one with a thicker thread that makes the pattern. So, it went slowly. Here’s the end of the warp. 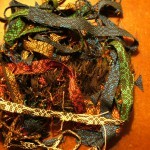 Then I washed, dried, and ironed the cloth, and cut it into sections. 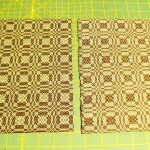 Then, for each book I decided whether to show the front or back of the cloth, because the two sides look very different. For example, in the photo of the black and white cloth, the piece on the left, with the white squares (tables) in the center of the round motif, shows the “right” side of the cloth. With this color combination, I preferred the back side. I used a paper template to center the pattern on the cover. I am a symmetry fan, so I was going for symmetry even if I didn’t always attain it. Cloth has a mind of its own. Once I framed the portion of the pattern that I liked, I cut the cloth to size, and glued the cloth onto book board (8.5 inches by 5.5 inches) with PVA glue. 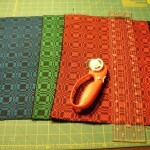 Then I trimmed the corners, and glued down the edges of the cloth on the inside of the cover. Then I pressed the covers. When they were dry, I cut and glued down nice papers on the inside of the covers. Matching paper colors and cloth colors is also a whole decision-making process. 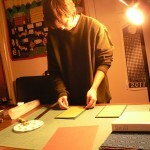 Here’s me gluing down the papers. Then I pressed the covers again until the glue was dry. Meanwhile, I folded the signatures, and put them under weights for a while. When the covers were dry, I punched holes in the signatures and holes in the covers with an awl, and sewed the whole thing together with 4 ply waxed linen thread. Ta-da, a book. Six are done, and six more are in the works. This afternoon I cracked open my new American Craft magazine. (It came a few days ago, but I wanted to finish the latest Science News first.) I had to pause for a moment when I saw the cover. “Hey, I know that guy,” I first thought. Then I was like, “No, he’s on TV. Help me, memory. Media worlds are blurry…. Um, am I awake? Ron Swanson!” In that order. Like many people, my sweetie and I love Parks and Recreation. Love-a-dove it. And I love this article about Nick Offerman. I love that he actually makes beautiful things with wood, that he is a craftsperson, that he thinks we should “take back our self-sufficiency,” that he urges people to read Wendell Berry. All of it. I was surprised and inspired. I smiled and felt silly and gleeful. Many thanks to Sally and Bob Fitz of Small Ones Farm for inviting me to table at their fruit CSA pick up days on Saturday October 1st and Wednesday October 19th. It was very inspiring to meet their members, and I had many stimulating conversations about CSAs, locally sourced materials, natural dyes, local wool, flax, and vegan cloth. At my table I displayed a basket of naturally dyed wool yarns that were mostly handspun by me, over the years, using natural dyes. 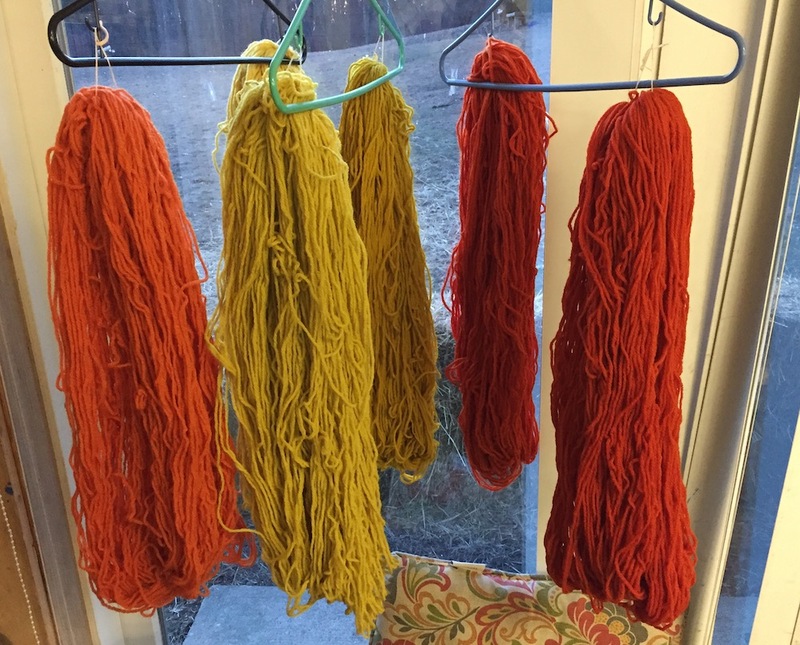 For the madder, I displayed the results of a dye bath using roots from Earth Guild. (I have also bought madder root from Tierra Wools and Aurora Silk.) For all the rest, I used plants I gathered or grew myself in Amherst or the surrounding area. When I first began spinning, the most economical way to acquire a lot of wool was to buy raw fleeces. I bought and have enjoyed working with Corriedale from the former Mad Women’s Farm in Amherst, Dorset/Border Leicester cross from Natural Roots in Conway, Coopworth from Shirkshire Farm in Conway, the mixed breed flock at Hampshire College, and Romney and mohair from a few farmers I met at the Webs fleece markets. 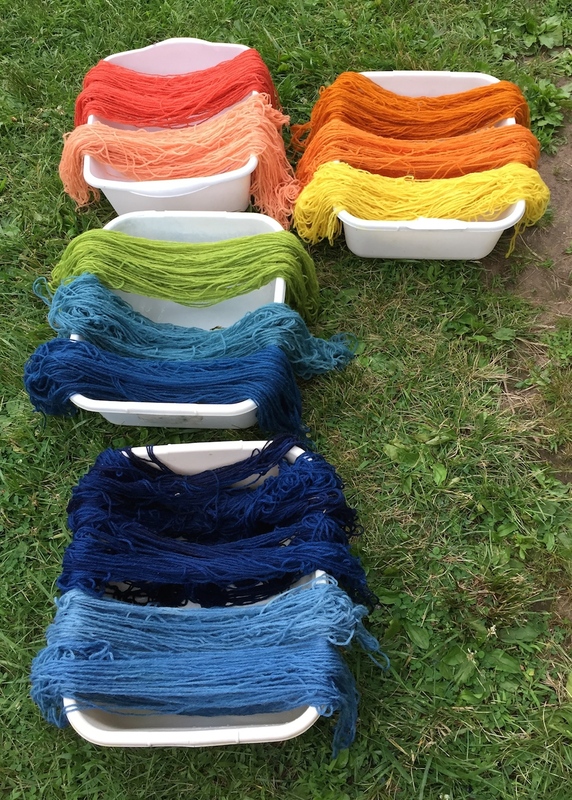 After I got tired of washing and carding my own wool, I’ve enjoyed roving from Balkey farm in Northfield and others. 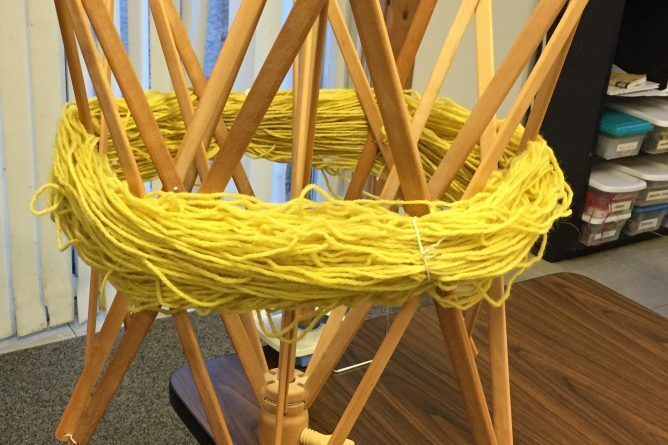 I also had a smaller basket of naturally dyed linen (commercial 40/2 from Webs). The yarns (and my bundle of home grown flax) were for show and tell. 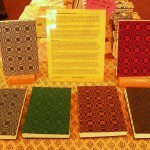 And for sale, I had handbound books with handwoven cloth covers. 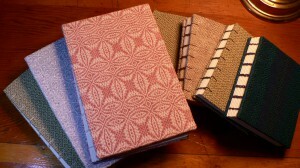 Some of my hand bound books with handwoven covers.